In an energy-starved future, the authorities of America's mega-cities strictly regulate transit, allowing only solar cars to roam the roads and mandating intercity travel by rail. But that hasn't stopped warring motorcycle gangs from tearing through the streets—and stealing anything they can get their grease-stained hands on. The Outrunners, written by Jonathan Gelatt and drawn by Andrew Krahnke is a retrofuturistic webcomic that wears its affection for stories like Akira and The Warriors on its sleeve. The eponymous Outrunners are an underdog crew of thieves who spend their nights heisting technology to sell and to keep their bikes running. They have to steer clear of the Metropolitan Police—who have failed to keep the city's massive population of youth offenders in check—but when a rival gang raids their headquarters, the Outrunners are eager for war. Krahnke's artwork gives the declining city a science fiction vibe, but what makes The Outrunners stand out is a careful attention to language and character. These kids are the throwaways, the leftovers of a damaged civilization that thinks it can save itself through strict authoritarian control. But they're no heroes; they're violent, amoral, and just as likely to boost tech from a poor mom and pop shop as from a wealthy outfit. Still, they're kids, and they're trying to navigate the tribal landscape of their city, a place where you better be a great engineer, a great warrior, or both. 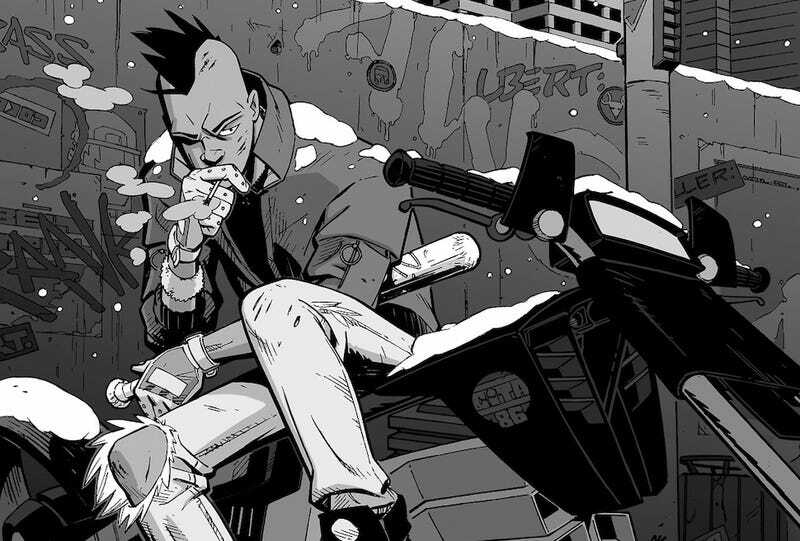 To help set the mood, the creators have collected an electronic soundtrack, the perfect accompaniment to the comics' action scenes with their bikes, bats, and guns.